Sakina (pictured on the far left) has been born and bred in the UAE. She is married, mother of a two year old and graduate in Mass Media. 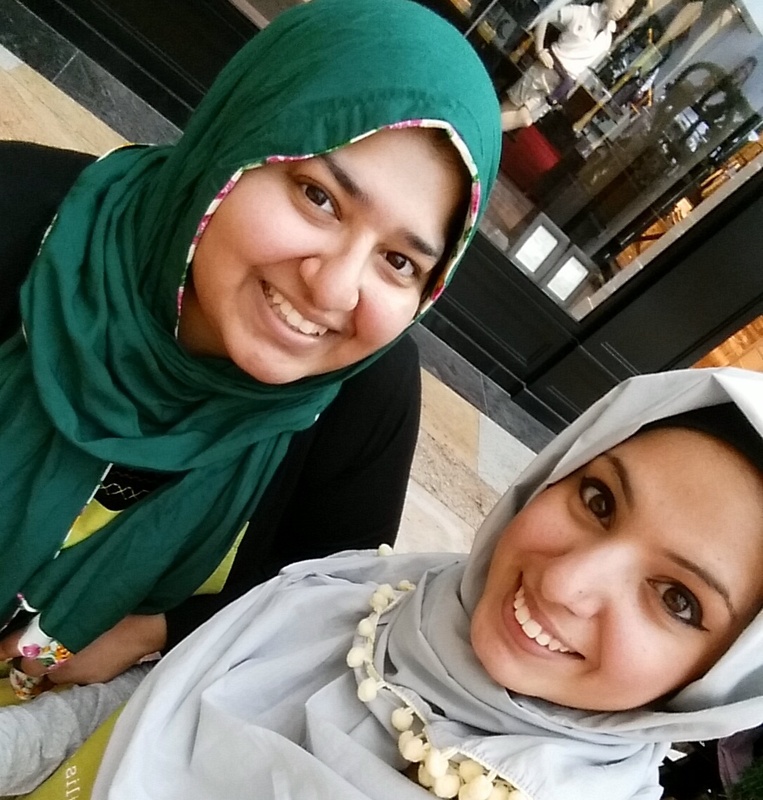 Laila (pictured on the right) was born and raised in California, before moving to the UAE in August 2014. She is married and has a Bachelor in Psychology. Sakina and Laila are cousins and even before Laila moved to the UAE, both of them have had a close bond. Both Laila and Sakina love a good old D.I.Y. and would normally find themselves busy with tiny projects. However, the idea of Hayaa Scarves took shape after they were required to attend an event but couldn’t find the right scarf to go with their outfits. We have all faced that problem, haven’t we? Looking into our wardrobes (normally filled to the brim) and not finding anything to wear! However, the ladies decided to do something about it, and created their own scarves for the event. Soon after that in March 2015, Hayaa was launched as a way of providing just the right unique and creative scarf, whatever the occasion. 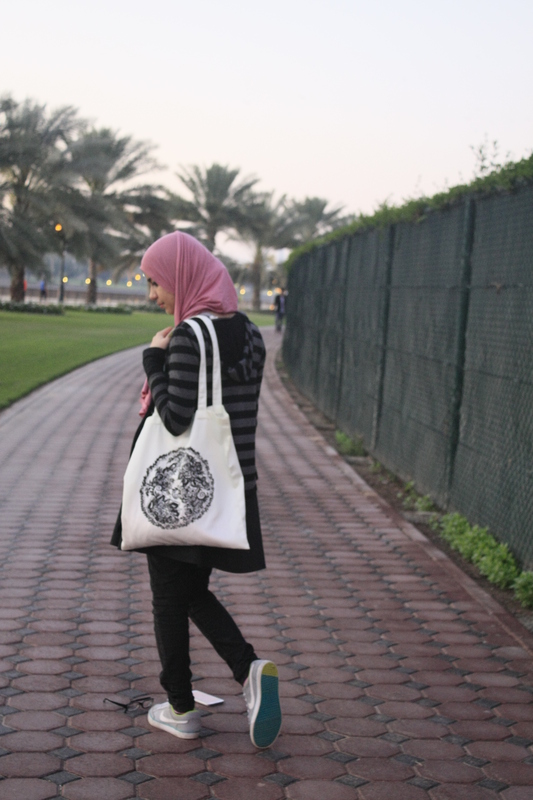 Hayaa has expanded to selling not only scarves, but also Tote Bags, Cushion Covers and Prints too! The inspiration for the name of the business came from a quote by Fatima R.A. (The Prophet P.B.U.H.’s daughter). She said “A woman’s best jewellery is her shyness”, and Hayaa means shyness or modesty. 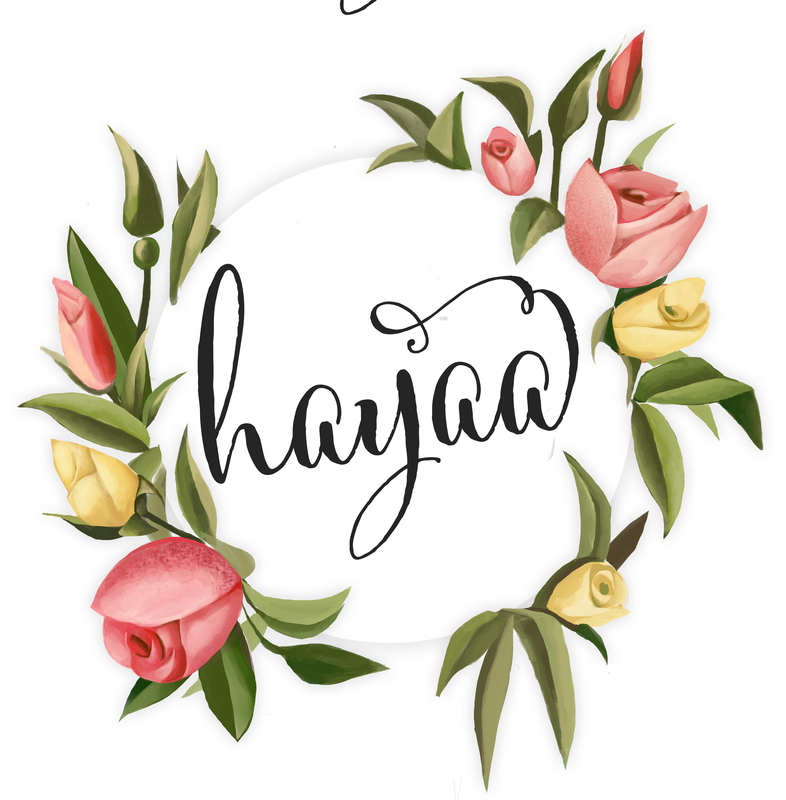 Seeing as the scarves are a symbol for a women’s modesty, the word Hayaa was a perfect fit. Sakina and Laila said the following: “We enjoy people appreciating our designs as well as being a part of a global trend that shows modesty and fashion aren’t independent of each other. That one can have their own unique style and still follow a religious obligation. And we feel this is important for younger generations who are struggling between two cultures, as we have in the West, to find that unique balance and to see Hijab as beyond an obligation but as something that they believe in and something that becomes a part of oneself.” I couldn’t agree with this more! Getting their products out there, especially through social media is one of the biggest challenges they face. Though they have been fortunate enough to have gained much popularity through word of mouth and connections, they wish to concentrate more on getting the business out to even more people through digital media. Sakina says, “Within ourselves!” Both ladies have merged their ideas together along with their cultures and life experiences. Their latest Mhendi collection is a tribute to their Indian heritage, and apart from mehndi designs, the scarves and accessories also include braids, mirror work, block printing and even prominent symbols such the Auto Rickshaw that India is so famous for. Laila and Sakina have also included a monument in Hyderabad into their designs, paying homage to the city they are from. 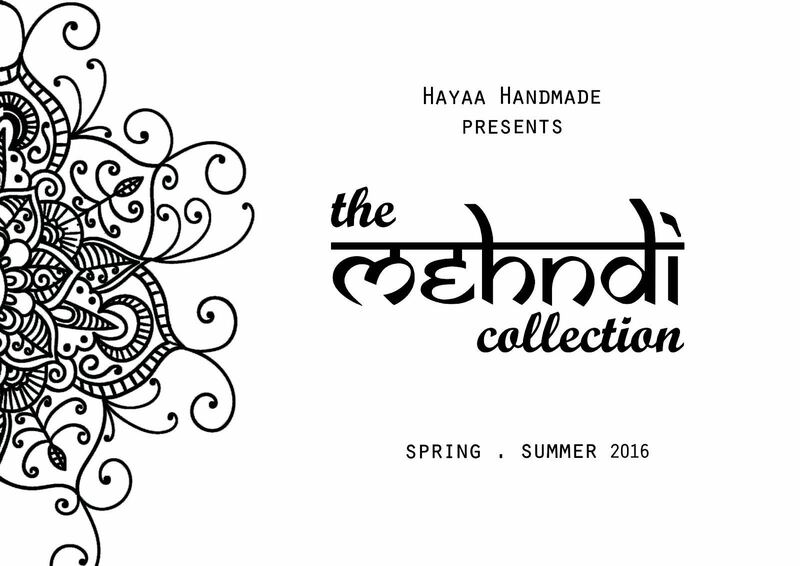 The mhendi prints have actually been created with mhendi by a professional mhendi artist and then been digitised. This means that the little bleeds have been captured in its authentic sense and makes the entire collection very much “legit” as Sakina pointed out. They have also been consistent with their colours, working with Mhendi Brown, Kashmiri Pink and colours from the same palette. The majority of Hayaa products are sourced locally in Sharjah. However, accessories such as the ornamental tassels are from India. The Khadi, a hand woven cloth that is primarily made of cotton, is sourced from India and is symbolic of the Khadi movement by Mahatma Ghandi. Laila and Sakina are using this cloth for their cushion covers to again include their Indian heritage within their products. Once the ladies have their materials, the products are hand made by themselves in the UAE. 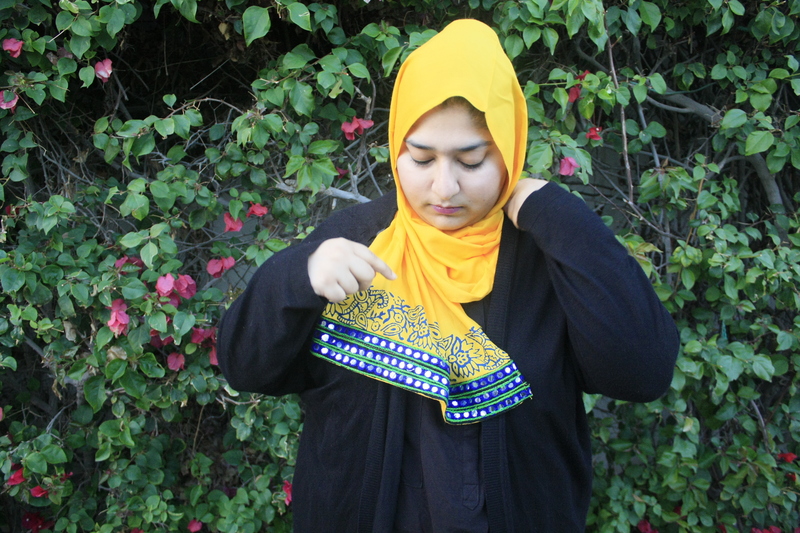 The products, especially the scarves, are unique in design and are made according to what Laila and Sakina have tried out and approved on themselves. They are certain that you will not find products like these anywhere else, and being products of limited edition, you must be sure to grab yours before they sell out. Another interesting fact about Hayaa is that Laila and Sakina donate 15% of sales to an orphanage school in Iraq, named Dar Al-Zahra. Since their families are actively involved with the charity, they know that the money they donate is making a difference for sure. Every week day is spent mostly on both Laila and Sakina concentrating on their family and work. However, the business Hayaa is managed during the weekends, mostly being Thursday nights and Saturdays, or even working on it whenever they can for example of lunch breaks during work or whilst Sakina’s daughter naps. Both ladies ensure to divide their time wisely and work efficiently to maintain the balance. On some occasions, both ladies will meet up to do the work together, and other times they will do it independently, making sure to co-ordinate the tasks between themselves. “Go for it!” is their advice for you. Both ladies agreed that utilising social media was key to any business. They also mentioned that Little Majlis is a great place for start up businesses as they provide an umbrella license and are very economical. By the time Hayaa reaches its 5 years milestone, Laila and Sakina would like to be offering international shipping for their products. Currently, their items are available in the UAE and through pre-order in the USA. They are hoping to expand the business by offering many more products and be an established company. Their ultimate aim would be for their brand to be recognised by people on the street. Laila and Sakina both very kindly gifted me with a mhendi brown Jhumka scarf and a Tote bag from their new Mhendi collection. I loved their cute packaging, and their dedication for their products really showed through. I love the gorgeous tassle at the end of the scarf as it can really accessorise an outfit and possibly substitute the statement necklace. Being of an Indian heritage means that I can definitely relate to the the mhendi design on the Tote Bag, though who can resist an intricate pattern anyway! Overall, I would say their designs are truly creative and I think with more time and resources, they can go a really far way. I can not wait to see more of their ideas come to life! If you would like to get your hands on these creative hand-crafted pieces or stay up to date with Hayaa’s upcoming designs, follow their work on social media or browse through their online shop. All photographs in this post are the property of Hayaa, and have been used by the owner’s permission. I love that it is all the labour of love and individually hand crafted!